For many years, my hard work in exploring and recording my observations of original DOCTOR WHO items (about only 10% of which is actually currently out there) had got my name known as an authority on the subject, particularly those relating to DALEKS. 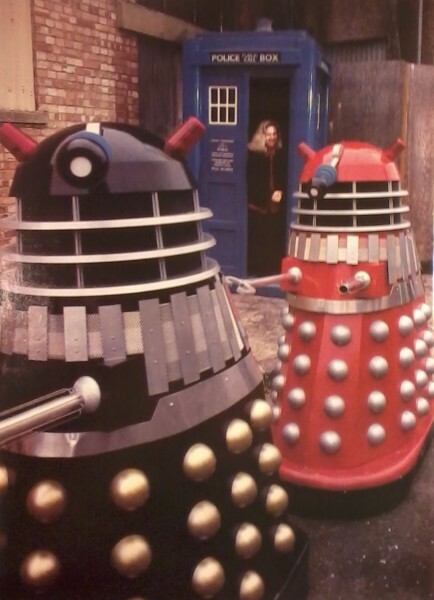 There was no World Wide Web, so often, in the 80s & 90s, I would get letters or enquiries from fans who wanted to make their own DALEK or TARDIS, and would ask me various specific question about either the basics of building them, or the intricate details. Eventually my information spread and so by being passed to other makers, began to become common knowledge (in much the same way that a new word doesn't instantly get put into a dictionary, but spends years growing and being absorbed before becoming set in stone). A lot of things I'd noticed by studying the subject matter, simply hadn't been seen by other people. I'm talking about the very early days of fandom, when there was so little around that it was up to us to discover it. If we were lucky, there might be a showing of an old 16mm film print by projector, at a Local Group Meeting. At one such event, I can clearly recall telling the fans there during the showing of the 2nd DALEK MOVIE, in 1979, to watch the DALEK claw get pulled off when the ROBOMAN was thrown over the control room railing. The claw was then back on again in the next shot, but no one had noticed that before. "Oh, yeah...!" said everyone present. The misaligned hemispheres on all movie DALEKS was another of the observations I'd made, never spotted before I'd noticed it. 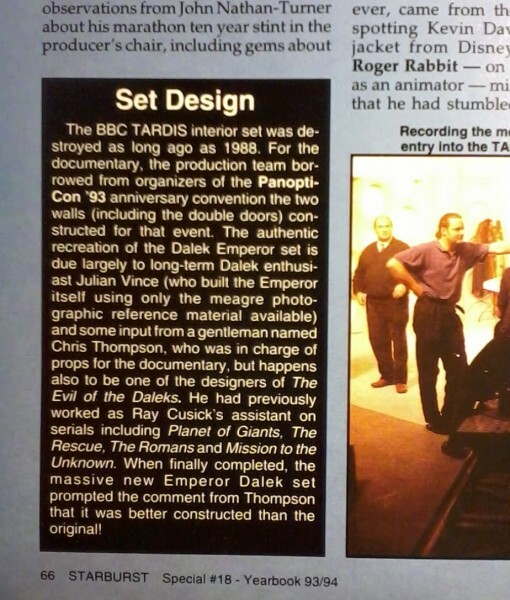 So was the misinterpreted 'numbers/ names symbols' on the 1963 original DALEK domes, along with the rolls of floor tape (thought to be their voice-speaker grills) as seen in DEAD PLANET rehearsal photos. I wrote about loads of similar discoveries and observations I'd made, back in the 70s & 80s. It was all new at the time and very common place now. But that's communication for you! Once you put this information out there, just like Chinese Whispers, its origins, over the years, become lost. So I've often had people tell me things ( with great authority in their voice) that were my original findings in the first place! Eventually, it's just easier to say, "Oh really, how interesting..." like you have never heard it before!